Eating healthy is important at every age. 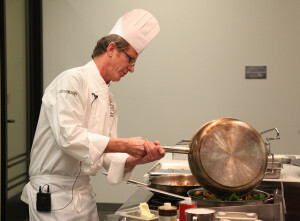 Cascade Culinary Institute’s Chef Julian Darwin will demonstrate techniques for seniors on preparing nutritious meals. Dietician Shelly Schwartz, RD, will discuss the nutritional content of foods and eating healthier when living with heart disease, diabetes and other chronic conditions. Afterwards we’ll eat lunch from the food prepared in the demonstration. Friday, March 18, 12 to 1 pm. No cost. Space is very limited. RSVP required. Call Lisa Hurley at (541) 771-3258 to reserve your seat. Located at Cascade Culinary Institute at Central Oregon Community College, 2555 NW Campus Village Way, Bend.